The Jewish Family and Children’s Service of Greater Philadelphia is committed to first understanding and then ensuring that our services meet the unique needs of the people we serve. To that end, JFCS has spent the past year extending our reach to the Orthodox Jewish community by deepening our understanding of that community and delivering services that are culturally sensitive. Assistance with benefits, resources, and support with basic needs through times of crisis. Resources and guidance related to budgeting and debt to increase the client’s ability to afford and manage monthly and annual expenses. Culturally sensitive clinicians and partnerships with community Orthodox professionals will assist families needing therapy to achieve stability and growth. Our supportive services are offered at times that fit in the challenging lives of our clients. We seek to offer support in nontraditional settings to facilitate the access to care. 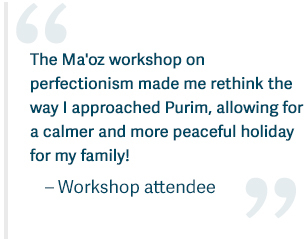 Develop a strong understanding of the varied and changing mental health issues facing our society, with a specific focus on how they impact our Jewish world. Implement the highest quality forum for rabbis and spouses to strengthen their capacity to respond to and address mental health issues in the community, increasing willingness of community members to seek Rabbinic support and guidance. Increase outreach efforts to serve and collaborate with the larger community (schools, synagogues, social service organizations) both locally and across the Northeast region. Implement several conferences annually for clinicians who serve the Jewish Orthodox community. Cultivate professional relationships and alliances with Orthodox clinicians to deepen their understanding of the Orthodox community’s mental health needs. Monthly meetings will enhance partnerships, education and create a supportive and unified opportunity for professionals. Develop and implement a targeted initiative to engage Jewish foster care families who are prepared and available for placement as needed. Bloom Ambassadors identify newly delivered moms for outreach, engagement, and connections to resources. Monthly “Mom Chats” and hosting of area experts on relevant topics. Engaging partners in support of postpartum moms. Magen Yeladim Safety Kid Program – This program is designed to prevent sexual abuse through messages of empowerment, personal boundaries, and control over one’s own body. Trained educators and a strong volunteer corps provide the classroom lessons.